What conclusion can we draw of Zandahar's history from this? Humans on Callisto are the dominant species. Despite this, the population seems thin. Much of Callisto appears to be largely uninhabited, even by hunter/gatherer societies, which is a significant anomaly. John Dark, for instance, wanders about the Grand Kumala with the Yathoon Horde, but until he meets Darloona, he sees no sign of human activities. Similarly, in other books, despite the characters wanderings, there is very little sign of villages or tribes or even wandering nomads outside of the principal areas of habitation. Partly this may be due to competition. It appears that the Yathoon Hordes, while no match for the civilized societies, are pretty effective at keeping hunter gatherer societies from intruding on their roaming grounds in the Grand Kumala and the Plains of Haratha. By the same token, the Zarkoon of the dark side may be pretty hard on possible local humans. It's noteworthy that on the dark side, the known human groups, the River and Cave tribes are geographically sheltered from the Zarkoon. Whatever the case, it appears that humans do not dominate on Callisto the way they do on Earth or even Barsoom, but generally have a limited geographic range, and a relatively small population within that range. In the fertile crescent area, civilization exists as a series of bronze or iron age city states. In the north, dotting the Corund Laj, is the Grand Empire of Perushtar, in reality, a loose confederation of city states, occupied by bald and red skinned Perush. Their cities are Perushtar, Soraba, Narouk and Farz. Tharkol is a hybrid Perush city. The Perush are sailors and traders, and their culture is said to resemble that of the Phoenicians. For much of recent history, the Perushtar were dominated by the Sky Pirates of Zandahar. Unable to challenge the advantages of the air superiority of the Zandahar, the Perushtar were forced to pay tribute and were politically quiescent. Since the passing of the sky pirates, however, the Perushtar cities have become more aggressive, intervening with Tharkol, participating in the campaign against the Mind Wizards and threatening Ganatol. Soraba has allied with Tharkol and Shondakar. However, it is not clear whether the other Perush cities are operating on their own, or falling under the sway of a renewed empire. Ganatol appears to be on the verge of becoming a bone of contention. The Perushtar are the dominant ethnic group on the planet, their population dominating the four cities aforementioned, and an ethnic Perush/Chaac Yuul mixed population in Tharkol. Ethnically, the Perush are characterized by tomato bright, red skins and hairlessness. The population in Tharkol differs in having normal hair, but all other Perush are bald. The Perush are suggested to run to fat, perhaps an adaptation to their cold wet climates. To the east, nestled in the White Mountains, is, or was, Zandahar, home of the sky pirates. Ethnically, the sky pirates are Chaac Yuul, who are also represented by the Black Legion, and by hybrid populations in the cities of Ganatol and Tharkol. The Zandahar have papery white skin, straight black hair and unslanted eyes. The hair colour may vary to a light ‘colourlessness’, and eye colours may go to yellow. The most technologically sophisticated nation on Callisto, this city-state had mastered the art of building lighter than air craft, airships, which it used to dominate and terrorize its neighbors. Through intricate use of simple mechanics, levers, pulleys, cogs and clockwork, as well as the crafting of lightweight paper/plastics, and a fortuitous supply of a lighter than hydrogen gas, the Zandahar remained eminent. By the way, the fact that the Zandahar were able to build such complicated mechanisms in their airships, suggested that they had mastered this technology for less ambitious applications. They may well have built clocks, or water wheel-mills, or windmills. They likely had a high degree of mathematics and precision engineering skills to construct gears and cogs. They also likely had a fairly comprehensive command of basic chemistry and organic chemistry. Or at least they did until Jandar blowed them up, blowed them up real good, in the Sky Pirates of Callisto. The city is now in ruins, although refugees and defectors have made their way to Shondakar, with the result that it now possesses an aerial navy. It's likely that there is still a relic Zandahar population, based in outposts, farming regions, observatories and other missions. And it is also likely that there was still a substantial aerial fleet outside Zandahar before it blew up. Some of these probably wound up at other cities, but some probably returned to Zandahar's ruins. Still, we can assume that at least a fifth to a quarter of the Zandahar are dead after Jandar's adventure. One interesting observation that can be made is that the Zandahar were probably originally a maritime people living around or on the shores of the Corund Laj. How do we know this? Because their airships are very clearly modeled on and patterned after traditional seagoing sailing galleons. This is revealing. If you were to develop an airship from scratch, it probably wouldn't resemble a seagoing ship at all, the requirements, problems and advantages of air and sea are too different. The only reason to make an airship in the image of a seagoing ship is if you were used and acquainted with sea travel first... That the making and sailing of seagoing ships was an essential part of your culture. In that case, the plans and blueprints would be so well established that it would be your automatic starting point, much the same way that early automobiles took horse-carriages as their automatic design starting point. What is interesting about the Zandahar, however, is the great lengths they went to develop a working airship, without drifting away from the design for seagoing ships. What does this tell us? It suggests that the Zandahar airships were perfected or developed very quickly, from the original model of sea ships, and then departed very little after that. This implies that many of the skills of fabrication and lamination were already existing in the Zandahar culture when they started producing their airships. Essentially, they must have been taking things ‘off the shelf’. They wanted to build ships, so they used their plans for seagoing ships. Traditional materials were too heavy, but they could adapt the laminating technologies to produce lightweight ships in the traditional form. All the critical elements or tool kits for the sky galleons were already established. This is important. For instance, if they did not have laminates and had to make do with canvases or cloths, then they would have developed a balloon, and perhaps blimps or zeppelins. This doesn't rule out refinement after the initial development, there probably was a lot of design refinement, particularly in the cogs and wheels used to make and flap the ships wings. But the key elements remained ship-like. First, the Zandahar were an established, nautical culture transplanted to the mountains and air piracy. If their culture and technology had evolved in the mountains without nautical influence, it would have developed differently. It's almost certain that the proto-Zandahar were originally based around the shores of the Corund Laj. While on these shores, they perfected both sailing and laminating technology. To avoid confusion, we'll call the lost city of the proto-Zandahar: Chaac. The Chaac would have been a fairly aggressive people, exploring inland to the White Mountains, founding colonies in Tharkol and Ganatol, and challenging the Perushtar. Why do I say that they likely founded Tharkol and Ganatol? Because both of these communities are now hybrids. Which means that they would have been under the influence of Chaac culture at some point. But Tharkol would have had to have been a Chaac Yaal city first. Again, why? Look at the map. The Perushtar culture probably originated in Perush and spread from there. Perush is in the north and west of the Corund Laj. Tharkol, on the other hand, is in the opposite direction, the south and east. Which means that Tharkol would have been the last major Perush colony. The Chaac were probably located on the east, or the southeast of the Corund Laj. So they're much more likely to have been the ones to establish the colony first. Another thing that appears from the map.... All the Perush cities are on the coast, Tharkol is far inland. 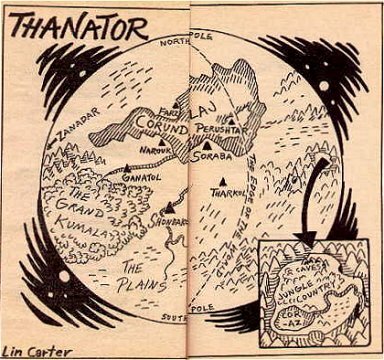 As for Ganatol, while it may well have been settled by the Ku Thad first, the map shows that it sits on a major river draining into the Corund Laj. Which means that the Chaac had a highway straight to it. On the other hand, it is overland from Shondakar, the principle site of the pure Ku Thad ethnic group. Of course, its possible that the Ku Thad emerged from the Grand Kumala and traveled down both rivers. The Chaac would have at least partially explored the White Mountains, and discovered of the principal sources of the lifting gas. It seems an impossible coincidence that a major city would be founded unknowing on top of the critical resource that made its success possible. More likely, the gas was known, and perhaps there were some proto-industrial facilities established there before the city of Zandahar really took off. And finally, of course, they would have tussled with the Perushtar. Proof? Chaac must have existed, given the four tributary populations of Zandahar, Tharkol, Ganatol and the Chaac Yuul. None of these tributaries was really situated to give rise to the others, so there must have been a common origin. And... its not around any more. Chaac was definitely a maritime society on the Corund Laj, judging by Zandahar's technology and culture. This would have put eventually put them in direct contact with the Perushtar. Its unclear as to which culture went to sea first, it could have been one or the other, or both simultaneously. The likelihood is that Perushtar was the first maritime culture, given that its settlements surround the Corund Laj, while the Chaac remnants are all inland. However, the Corund Laj was not big enough for two powerful seagoing nations. The result was eventually a war which destroyed the Chaac, and sent their survivors fleeing to the three colonies. It was definitely a war. Chaac and its sea power was obliterated. The most vulnerable colony, Tharkol which was overland and unprotected, was overrun and became ethnically a mixed Perushtar/Chaac colony. Ganatol was easier to reach than Tharkol, but its river basin geography made it easier to defend than the Tharkol, who were pretty much sitting ducks. The Chaac Yuul probably began as wandering refugees and became a landless nomadic mercenary people. 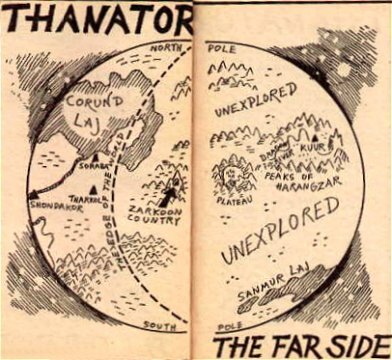 Only the Zandahar, most remote from Perushtar and most difficult for the seagoing peoples to reach (a military caravan from Soroba to Tharkol was a simple thing, a matter of money and supplies, a military caravan into the white mountains was creative suicide) remained ethnically and culturally pure. And indeed, like many colonial societies, it placed great stock on preserving the original culture and ways of its forebears. As for Perushtar, well, here we have the origins and current state of the Grand Empire of Perushtar. Left to their own devices, there was probably little reason to forge the Perush City states into an empire, and for the most part, it would have been difficult. Each city state would have been roughly equal, with similar home ground advantages. The Perushtar should have evolved more or less like the Greek or Phoenician seafarers, as a loose collection of city states. And in fact, that's how they turned out. But they have a now largely historical ‘Imperial’ tradition. So there has to be something in their history to justify an Imperial phase. A major war of genocide between two seagoing cultures would do the trick. The ancient Greeks never united until the Persians forced them to do it. The Perushtar were probably forged into an Empire by the war with the Chaac. And of course, once the Chaac were eliminated from the sea then the Imperial structure began to fade, until by now, its only a ceremonial thing. Of course, a few decades later, the Sky Pirates of Zandahar began to make the Perushtar pay for their victory, and they've been paying for it ever since. The Shondakar are home to the Ku Thad ethnic group. They are characterized by golden or tawny coloured skin, green eyes and red hair. There's some indication that their eyes are more oriental than western. The city of Ganatol is home to a hybrid Chaac Yuul/Ku Thad population, and most bizarrely it appears that the cave and river people of Cor Az on the other side of the planet are also ethnic Ku Thad. Certainly, this makes the Ku Thad the most anomalous of Thanator's three major ethnic groups. It's not really clear where they came from, or how they came to be where they are. One possibility is that the Ku Thad were the original Corund Laj population, and that their settlements moved up the rivers to Shondakar and Ganatol in the east, and down from the Corund Laj to Cor Az in the west (neatly bypassing the Zarkoon), before their main settlements were wiped out or overrun by Chaac and or Perushtar. One problem with this, of course, is that there are no apparent ethnic traces of the Ku Thad at all in the Perushtar empire. If all three ethnic groups originated in the Corund Laj, we'd expect to see more hybrid societies around the sea. Instead, the hybrid societies are at the margins of Perush territory. Another possibility, entirely speculative, is that the Ku Thad began in the south, either on the plains of Haratha or near or at the Grand Kumala region. On what basis do I argue this? Well, John Dark's teleport and ruins are in the southern tip of the Grand Kumala. Unless there was some feng shui reason to build there, its likely that this location was once a thriving and incredibly advanced metropolis. So, someone was living there, once upon a time, though we don't know who. The other end of the teleport on Earth is in the city of the ancient Khmer, and Dark seems to feel that there are some ethnic similarities between the Khmer and the Ku Thad. Certainly there's almost no overlap with the Chaac or Perush. So, provisionally, I'd site the ancestors of the modern Ku Thad in this location. What happened to this lost city? Unlike the Chaac and the Perush, we don't really see any evidence for a war or military conflict with another ethnic group or city state. The most likely possibility is some sort of environmental crisis. Remember that the Plains of Haratha are a delicate, water-poor ecosystem. Any ecology which features large mobile plants which search for water obviously has a water shortage. Here and there on the plains are stands of trees, but on the whole its grassland. The inference is that there isn't enough groundwater or rainwater to support more than grasses for much of the plain. We can assume that the lost city was a major agricultural centre, possibly depending upon irrigation from the Kumala. All it would have taken would be one, or perhaps a few seasons of drought and water failure, and the lost city would literally dry up and blow away. Indeed, the original Ku Thad may have created their own drought by overtaxing the regional water system. It wouldn't be the first time that intensive agricultural practices have used up local waters and turned an area into a desert. Its inhabitants would have to move or starve. If that's the case, then the Ku Thad obviously split up. One group struck east across the plains, moving into the Farside, establishing the city of Kuur (possibly) and occupying the Cor Az. For whatever reason, Kuur (if it existed ) failed, but the Cor Az population thrived at primitive levels. (Another possibility, for the record, is that the original Ku Thad might have been driven out by the Yathoon, whose territory overlaps these areas). Why would I suggest Kuur may have existed before the Mind Wizards? Well, first, there's a lot of stonework, buildings, rooms, corridors and passageways. This seems like a lot of work for the Mind Wizards to build, particularly if they haven't been on Callisto all that long. And it seems remarkably overbuilt considering their actual needs. So in my view, its likely that Kuur was built and abandoned, and the Mind Wizards simply moved into well preserved ruins. Second, if the ancestral Ku Thad of the Cave and River people were coming from the East (once again, avoiding the Zarkoon), they would have passed through the Harangzar valley on the way to the Cor Az. Given that it's a fertile and sheltered valley complex fed by a stable river, there's no good reason why the Ku Thad wouldn't have set up shop there. It's worth noting as well, that the name Kuur is reminiscent of the ethnic name Ku Thad. Both sport the ‘Ku’ prefix, which suggests that the people of an original Kuur might have been descendants or relatives of original Ku people. Why was Kuur abandoned? Two possibilities. First, the Dragon River is fed by the Cor Az lake, which in turn is fed by the surrounding mountains. So, its possible that the river had its own drought and went dry for a few years. Alternatively, Kuur might well have become a Zarkoon hunting ground. The Cor Az people's jungle and cave lifestyle shields them somewhat from the Zarkoon. But the Kuur people were out in the open. Actually, thinking about it, I believe that the Ku Thad must have preceded the Chaac into the area, otherwise, Shondakar would have been a hybrid city like Ganatol, because it too is easily accessible by river. The Chaac were water travellers, and there's no good reason they'd go down the Ganatol river and not the Shondakar river. So the odds are that the Ku Thad established both cities and that the Chaac managed to take over the weaker of the two. Given that the Ku Thad were land travellers, while the other ethnic groups were water travellers, it seems likely that landlocked Tharkol may have originally been founded by the Ku Thad. However, if this is so, it would appear that they were fully supplanted by first the Chaac, and then the Perushtar, leaving comparatively little trace behind. In Lankar of Callisto, there is also reference to tribes in the Grand Kumala, as well as Ku Thad who have gone ‘native’ and went for the forest lifestyle. But they don't seem populous, and we don't hear much of them. Despite the remarkable ethnic diversity, Callisto is effectively a monoculture. Carter points this out as one of the mysteries of Callisto, but never gets around to supplying an explanation. All Callistans, even the nonhumans, and even the humans on the dark side in Cor Az, speak the same common language, and there is no evidence of any other indigenous speech. All the humans seem to carry the same religious beliefs, basically an informal and no-pressure polytheism with a pantheon of gods or ‘higher beings’ called ‘the lords of Gordrimator’ residing in Jupiter. With the notable exceptions of Zandahar and the Dark Side tribes, the level of technology is uniform. For the day side, the forms of social organization are constant, with polities organized into city states and divided into hierarchical classes which include nobility at the top and slaves at the bottom, ruled by a sovereign. In short, Callisto is topsy turvy, with essentially a common language and culture, but divergent ethnic groups. One would expect that ethnic groups would take far longer to diverge than culture. Here on earth, there are many situations of peoples who are ethnically identical, but who have widely divergent languages and culture. Obviously, this is hardly a naturally occurring situation. It is possible that all of the ethnic groups emerged indigenously and once sported unique cultures and languages. Then, at some point, one group managed to dominate the others so completely that their languages and cultures were literally eradicated. This sort of thing has been tried many times on Earth, with varying degrees of success. The most likely candidate for such an effort are the Perush who seem to be the most widespread ethnic group and whose sea power would allow them the greatest opportunity to triumph. This may suggest that the ‘Grand Empire of Perushtar’ is actually a historical name recalling old glories, much like the Holy Roman Empire, rather than a current entity with punching power. This would do much to explain the linguistic, cultural and technological uniformity on the day side, but leaves the dark side tribes as something of an anomaly. But the problem is that the rise of the Perush, while explaining the relationship to Chaac cultures, doesn't explain the Ku Thad, who really do seem to be from left field. The Chaac were widespread, but obviously unsuccessful. The Ku Thad might have influenced that Chaac, but are obviously not in a position to dominate the Perush. Rather, it seems that apparently widely separated and ethnically distinct groups all started with essentially the same cultural tools. There's also the problem that one would expect surviving indigenous traces in language and culture, which don't really seem to be there. The thing is that if you are obliterating an indigenous culture and making them adopt yours, you generally have all sorts of little anomalies sticking around. Old style place names, old style ceremonies, modes of dress, etc. I don't think we really see a lot of this here. It's possible that there is, there's just not a lot of evidence one way or the other. The local style is always hard to stamp out completely, unless you are intent on obliterating the natives entirely. Another mystery is the lack of ‘hunter/gatherer’ populations. On Earth, 99% of all cultures have been hunter/gatherers, for 99% of our history. Hunter gatherer cultures spread over every part of the planet, including areas like the arctic, siberia, rain forests, open plains, which were inhospitable to cities. We've seen on Thanator that there are likely only a few areas hospitable to cities and city states. But there are plenty of jungles, plains, mountain regions, etc. which should have supported an indigenous series of hunter/gatherer cultures. Where are they? Its possible that the Yathoon and Zarkoon are simply too efficient for hunter gatherer societies to really take root. But the Yathoon and Zarkoon have definite ranges. Why don't we have mountain tribes, or polar tribes or jungle tribes away from the Yathoon and Zarkoon? And how did the City state culture evolve, presumably from more primitive hunter/gatherers and villages, in the face of competition from the Yathoon and Zarkoon. It's a puzzle. The human City States may well be able to hold their own against Yathoon and Zarkoon. But unless they emerged out of nowhere, fully established, then they had to come from more modest beginnings. If hunter/gatherer societies cannot hold their own against the nonhuman races, then the predecessors of the city states shouldn't have been able to either. Unless, of course, the City state culture was fully established from the beginning. Indeed, the absence of hunter/gatherer cultures (except in Cor Az, where there's been a clear regression) which would have been the predecessors and leftovers of the city state culture, suggests that there was never a hunter/gatherer culture on Thanator, and that they literally started full grown from scratch. Which means that the most likely possibility is that the planet was settled from the outside by an established culture or cultures which simply left their remnants around Thanator in different locations. The different ethnic groups were either already within that culture, or developed from it. This ‘dropped in from above’ theory may better explain the anomaly of the dark side tribes who still retain the language, but lacked the resources to achieve a higher level of civilization. Given that the Callistans are fully human, to the point of being sexually and reproductively compatible with Earth humans, it really doesn't seem like such a stretch to say that they are not native to Thanator, but are the leavings of an earlier space travelling civilization. And speaking of levels of civilization, one interesting question is why haven't the Callistans reached a higher level of civilization. Really, for the most part, they're just poking along at little better than Bronze age levels. The truth is, they probably have gone about as far as they can go. The Callistans have serious power handicaps. Only two significant domesticated animals are recorded. One is the Thaptor, a fairly obnoxious four legged bird which is capable of carrying a human weight. The Thaptors are only partially domesticated and apparently unsuitable in urban areas and apparently unsuitable as draft animals for carrying loads or pulling plows. Jandar reports that while they are extremely fleet, they tire easily and perform best in bursts and rests. The other is the Glymph, a lumbering rhinoceros-like beast of burden which seems to be of limited distribution. The Glymph does not appear frequently, and does not seem to be used in agriculture or within cities. Their principal use seems to be in hauling large caravans. It's possible that their effectiveness is impaired by slow reproduction, comparative physical weakness, lack of trainability, etc. Whatever the reason, they don't seem to be in large scale use, and it is not until Mad Empress of Callisto that we encounter them. There is a third potential 'beast of burden' the Ghastozar, a larger, voracious flying reptile ridden by the Mind Wizards. We must consider this creature only partially domesticated, since there is no evidence of it being used by cultures other than the Mind Wizards. In short, with only marginal exceptions, there is no significant source of animal horsepower. That's a big drawback. Early Eurasian civilizations had the advantage of the horse, the ox, the goat, sheep and the camel, for doing heavy lifting, carrying and transport. The absence of these animals was a major impediment for the New World civilizations like the Aztec and Inca. The Inca of course came up with the Llama, but that critter never made it into North America. The Aztecs had to walk everywhere, they had to pull their own plows by hand, and they had to carry their own loads. The closest thing to a beast of burden in North America were dogs who pulled sleds and travois. The absence of effective and powerful domesticated animals, as with the Americas, is a major drawback for Thanatorian culture. Indeed, the most advanced Thanatorian culture, Zandahar, is so starved for horsepower, that they have a perpetual desperate need for slave labour, importing their slaves from many neighboring cities and enacting regressive ‘one strike and you're a slave’ laws. Given their mountain location, its likely that the Zandahar made extensive use of waterwheels and windmills, but obviously, human muscle power had to be a big part of their economy. Transportation is a problem as well. Except for the Perushtar along the Corund Laj, most of the city states are inland. River and canal travel, water travel is probably a dominant mode of communication. It's worth noting that six of the known city states are either on the Corund Laj, or on a major river. Only Zandahar in the mountains, with its aerial fleet, and apparently isolated inland Tharkol are exceptions. There are few roads, and no significant roads between cities. 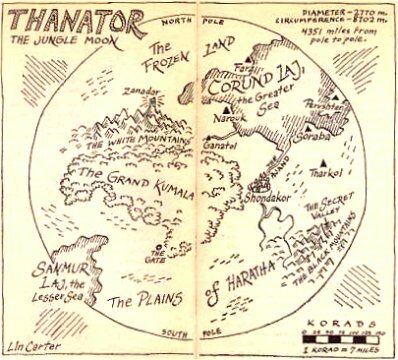 Tharkol and Shandakar are very close to each other, as are Soraba and Tharkol, but no road connects these states. Communication and trade between City states (outside of the Perushtar) is minimal. For instance, in Mad Empress, its disclosed that Tharkol, one of the closest cities as the crow flies, has almost no relations to Shondakar. More significantly, it is noted that the vast expanse of plain or prairie has always been a geographical barrier. This is very telling, as most people wouldn't consider a stretch of flat land to be any kind of barrier. The fact that it is a barrier, and only infrequently crossed by trading caravans, suggests that the cultures of Thanator are strongly organized around their river systems for trade, travel and communication. Although there are numerous rivers draining into the Corund Laj, it is not clear that there is significant potential for water mills or hydro-electric power, apart from Zandahar. The presence of large rivers or seas for transportation means a canal or water based economy. But it also inhibits investment in significant roads, and that means that Thanator culture generally confines itself to wherever it can easily take a barge. They can probably access a lot of waterways, but the key to their actual expansion is that those waterways have to be able to support their most economical freight boats. Waterways which require more expensive freight boats, are at an economic disadvantage, and settlements there will tend to wither. Waterways which can't accommodate freight, aren't settled. The result is a restricted population, and very limited expansion. In short, there are real handicaps for the Callistans in terms of being able to generate the required levels of horsepower and expansion to really have an industrial revolution and make it stick. We know that the Mind Wizards are not native to Callisto. We also have reason to believe that the Yathoon and Zarkoon are not indigenous. It is likely that the actual origin point of the humans of Callisto is Earth, either directly, or indirectly through Barsoom. As to how they arrived, there are three principal possibilities: 1) Astral teleportation, as per John Carter and Ulysses Paxton. 2) The Teleport device linking Cambodia to the southern hemisphere of Callisto. 3) Space vehicle travel by ancient Earthlings or Barsoomians. It is likely that the real story is some combination of the three.